A few years back, we chose a Cloud of the Month which we didn’t feel very confident about identifying. Since it looks rather like the surface of a choppy sea viewed from below, we gave it the nickname of the ‘Jacques Cousteau cloud’, after the legendary 1970s French diver and ecologist. But as we started receiving more and more dramatic examples of this cloud formation from members and visitors across the world, we decided that it warranted a more official-sounding name. We looked for a Latin one that would sound at home amongst the official cloud classifications and settled on ‘asperatus’, which is the Latin for ‘roughened up’. The term was used by Classical poets to describe the seas being agitated by strong winds. We propose that asperatus should be adopted as a new ‘variety’ of cloud, meaning that it is a particular characteristic that appears in one or other of the main cloud types. This would mean that the rough and choppy looking Altocumulus cloud shown above would become known as ‘undulatus asperatus’. Our proposed new cloud variety shares some similarities with existing formations such as the more regular waves of undulatus clouds and the hanging pouches of mamma clouds, but we feel that this cloud is different enough from them to be classified as a variety of its own – or a ‘supplementary feature’, if you want to be precise about it. Who knows whether asperatus will eventually be accepted as an official variety? If it ever is, we will celebrate with a snorkelling holiday. We had a nice example yesterday, Oct. 18, 2011, though not in these colors. It was over Dayton, Ohio, USA, about 2:00pm, moving northeast. Surface winds were from the west. Someone sent me a photo of this wavy cloud over Dayton. 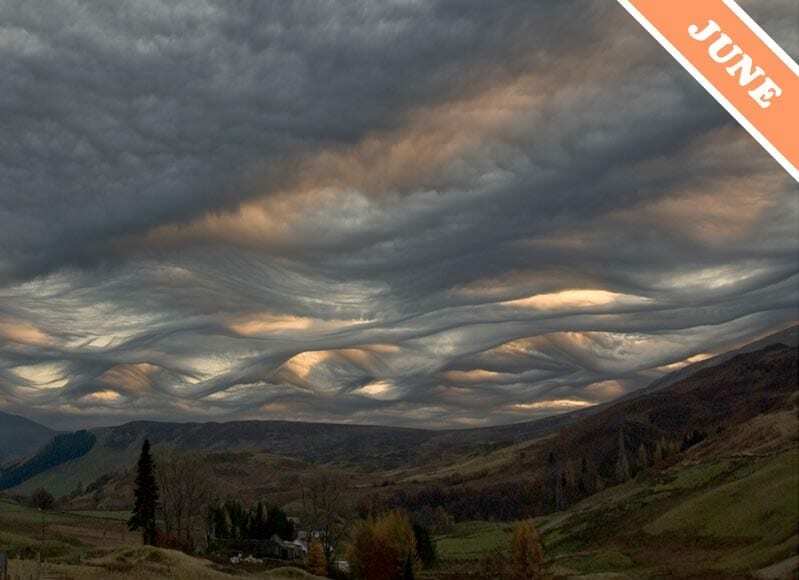 The cloud subspecies asperatus should definitively be official. Really, could there be a more auspicious name than the Jacques Cousteau cloud?!!! I think you should forgo the latin and flash names, and go with Cousteau, for the name evokes the sea, but also it carries great honor. (You could have the technical name as the name in the background also. Oops, forgot o add- the pictur is unblievably beautiful. it looks like a real version of something Van Gogh had painted. Hello, i’m french (so sorry about my english), living near Reims. I saw this the august 26th 2011 at morning. I had never seen this before… so i took a photo.